Amongst the tribes of human kind, myths speak of supernatural creatures inhabiting the deep woods of the earth. Myths come from the same place that dreams and art come from, they bubble up from the depths of our soul as we seek to interpret the world around us. They can’t be forced or contrived, but can be reinvented and reconstructed to satisfy the human need to explain the world we live in and our place in it. By reinventing our myths, the stories we tell ourselves determine who we become and who we are. Click on image to enlarge. 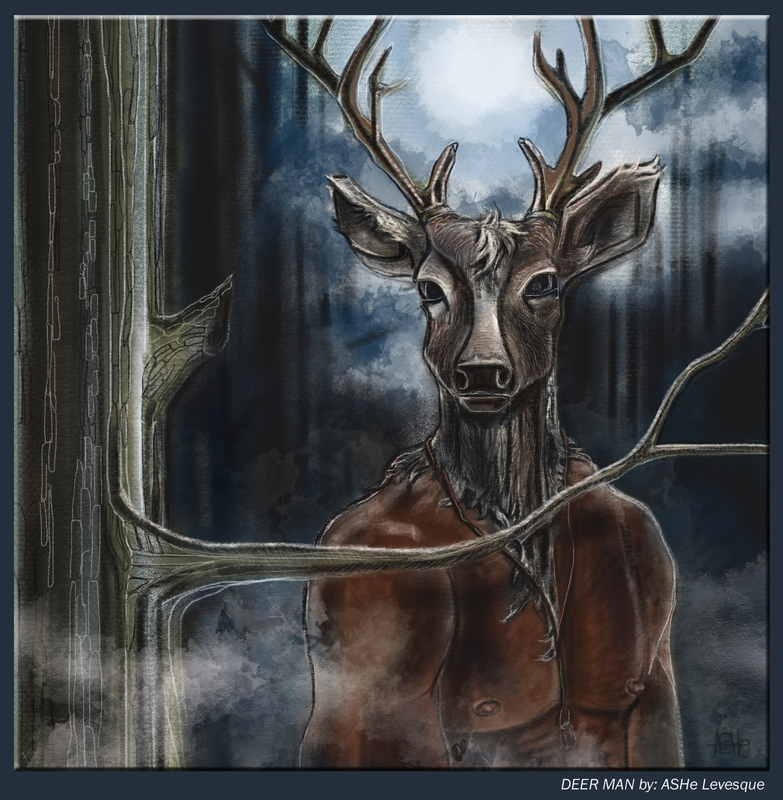 At first glance at “Deer Man” by ASHe Levesque, I was instantly wowed. To think that someone could express such mythos, power and gentleness into a beautiful and vivid image was impressive. The expression on the subject’s face allowed me to feel engaged as if I were a part of the art piece. It brought me back to my ancestral home in the woods, back to a connection forged long ago. Deer Man is a combination of human, animal and nature. He teaches us that we can never be separated from the natural world, that we are part of the earth. He represents our longing for nature, our need to feel an emotional bond with the ecosystems and other creatures with whom we share the planet. Something in us dies every time we destroy an ecosystem. We feel a loss of connection. From the depths of our soul, Deer Man speaks to us about what we have lost and gives us hope for what we can save. He connects us by restoring our consciousness of the natural world. To preserve the earth we must love and respect the earth as much as we do our own lives. When asked about my inspiration to create Deer Man, a tale of my youth unfolds. All through my childhood my parents would take my siblings and I camping for summer vacations. Nature is the most powerful form of hallucinates. It awakens a child’s mind and senses that no other place could. Our nightly ritual around the fire would involve singing, laugher, and of course a spooky story or two. We would be then sent off to our tents leaving the adults to their world. Inside we would whisper and watch distorted images being illuminated across the canvas like a movie screen, cast from the night sky and fire in the distance. Our stories would unfold of the creatures and animals that lived on the other side of the thin canvas that were either here to protect us or drag us into the abyss of the night. Deer Man is the protector of all that is pure and innocent. His powerful body protects us, while his angelic eyes search for purity and kindness in all. Collect affordable gallery quality Art Prints and other products by Society6 artists from around the world. Ashe Randall Levesque was raised in a family of five boys in the small town of Arnprior Canada, Ashe’s house was never short of a story to be told nor was it lacking excitement. His first artistic mentor was his Father, Ed Levesque. Using any surface he could find he would draw (upon request) for his sons, Mickey Mouse or wild ponies would be part of a napkin, or table top. Throughout high school Ashe knew he had some artistic talent, but never felt a need to pursue it. It wasn’t until his late 30’s that he had discovered his hidden gift. His 1st painting was a large 3’x5′ canvas for a friend’s birthday. He began painting his premier Angel. Ashe truly believed that someone else was inside him when he began to paint. It felt like he had done it before in some other lifetime and some guide was using his hand to create. Ever since that moment he has been keeping his hands to the brushes and enjoy all the diverse options to express himself as an artist. As a self taught artist, he always challenges himself by setting up a show, and then uses the deadline to stoke the fire! Ashe has found that creative pressure can be most invigorating. Previous showings have been in Ottawa, Canada, and locally in his current home of Montreal. His work has also sold in the international market and through social media. Ashe works mostly with acrylic-conte on canvas or wood, but recently he has been experimenting with a complex combination of digital drawing/painting on a computer tablet as a base and then transferring the image onto canvas then continuing to work in traditional mediums. He is a diversified and multi talented individual in both life and art. You will take notice, through layers of time as his art takes on various dimensions, moods and reflection using bold color, linear contouring or aura like energy fields around the subject. His process will either bring you into a tenacious point of wonder or send you gently off the canvas after a peaceful journey of the eyes.